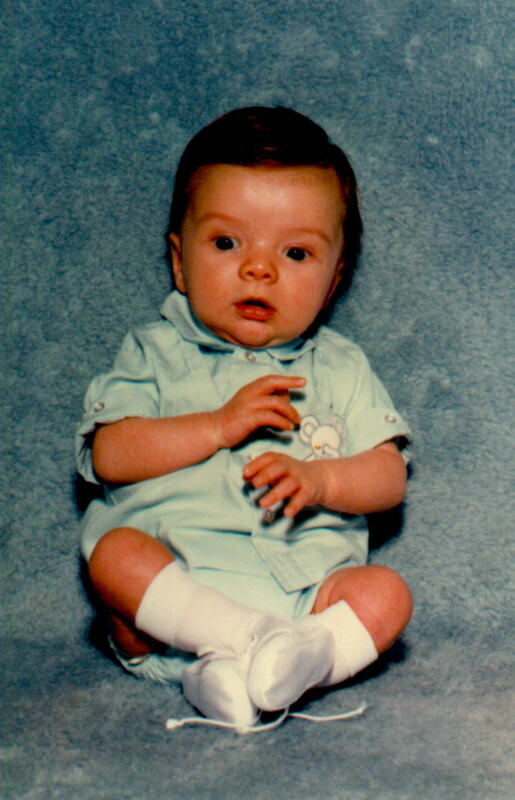 Justin Andrew Nash was born in Columbus, Ohio, on March 4, 1982. He lived there less than two years before we moved to Garland, Texas, a suburb of Dallas. He was twelve years old when we moved from Texas to Mt. Olive, Alabama, near Birmingham. Even though the move from Dallas to Mt. Olive was somewhat of a "culture shock", it was the best move we have ever made. It allowed Justin to grow through the teen years with the good Christians at the Gardendale church of Christ. Their influence and example helped him to become the fine young Christian that he was. Although he had a little stubborn streak in him, he was a very good child. He never caused any problems as he was growing up. He was one of those children that was always thinking. Even though he was never afraid to ask the questions that popped into his mind, it was not long before we realized he was the type of person who was going to do more thinking than he was talking. The older he grew the more we could tell that he was going to take after his father; logical in his thoughts, quiet, and a little shy. By the time he was three years old, he was starting to show a talent for art. He had an especially good ability to draw faces and show different emotions in their expression. By age six he was so good at drawing the well-known cartoon characters from the comics such as Garfield, Mickey Mouse, and Snoopy, that people would not believe that a child his age had drawn them. He also displayed a very good sense of humor and developed the ability to add a funny story line to his drawings. It was about that time in his life that he started saying that he was going to be a cartoonist when he grew up. He never changed his mind or spoke about any other occupation. When he was twelve he sent his first submission of a comic strip to a publisher, and got the first of many rejection letters. That motivated him to teach himself the tricks of the trade. He was soon reading everything he could find about the technical aspect of drawing cartoons such as what inks to use and what size panels were needed for publication. His skill started to catch up with his talent. He was looking forward to college where he was planning to major in art and learn the things that would be necessary to make a living doing what he loved to do. Another aspect of his life in which Justin showed an above average ability was in the area of spirituality. At an early age he showed a strong interest in religion. He was eleven years old when he awakened us at midnight one Sunday night saying that he needed to be baptized. He had been secretly thinking about it for some time, but had let another opportunity pass by at church services that day. While we were sleeping, he was lying awake thinking about eternity. After he woke us, we and a few other members of the small church we were attending at the time, met at the church building. After I baptized him for the remission of his sins, John West, who was the preacher, asked that Justin and I both lead a prayer. I remember being very proud as Justin thanked God for parents that loved him enough to teach him right from wrong, and asked God to help him in his search for truth. He never stopped his quest for religious truth. He questioned the things we taught him, because he knew that he had to believe for himself, not just blindly accept the things his parents told him. He studied other religions in addition to Christianity. We had many long discussions about spiritual things and he often amazed me with the depth he had for one so young. He knew that ultimate truth had to exist, and he knew that he had a responsibility to find it. He never found all the answers, none of us ever will in this lifetime, but he never quit searching. We were not surprised then, when his art became a mixture of humor and philosophy. Some of the cartoons that he would draw had underlying moral themes. Not only has this been a great comfort to us after his death, but it also has made it very easy to use these cartoons in the format of a book to teach some spiritual lessons. Below is something Justin wrote about 2 months before the wreck. A feeling of loneliness. A wide assortment of inward struggles. Living a complex lie. A jumbled thought process and an inability to sort it out. An inability to concentrate. Too many distractions, not enough distractions. The difference between what I am perceived as and what I really am. A slave to society. Prisoner of the system. Prisoner of other people's expectations. Prisoner to other's wishes and desires. Confusion. Want to change, afraid of change. Insignificance. The only enlightened one. The only unenlightened one. The present is all that exists. The past is but a memory and the future will soon come, erasing the present. Then the present becomes the past as the future rushes on in. Time is an illusion. Everything depends upon perception. Beauty is in the eye of the beholder. Without ugliness there can be no beauty. Without sadness there can be no joy. Without evil there can be no good. Everything must exist in order for it all to exist. Eliminate ugliness and there will be no beauty. Abolish sadness and there will be no joy. Destroy evil and there will be no good. Get rid of the Judas and salvation will be lost. Carnal vs. Spiritual. Sexuality vs. Spirituality. I exist, yet I question my existence. Existence is a burden. Non-existence is the only true peace and contentment. One man's truth is another man's lie. It all depends upon perception. But it stands to reason that ultimate truth does exist. Every question has an answer. Some are opinions, some are facts. What is love? Is it unknown to me? It's all bottled up inside. A proper outlet can't be found. Someday the contents of the bottle will no longer be containable. The bottle will burst, and the contents will be laid bare for all to criticize. Or the contents of the bottle will pass the expiration date and soon go sour. I have yet to find one who understands. Most think they do, but none truly do. Friends are a rarity. Associates are abundant. Lovers are non-existent. Must make myself known. But I can't. I'm merely an observer. A silent philosopher. One who fears getting too close, lest, lest what? Unreasonable fears. Unwanted shyness, meekness, and reserved emotions. Undesirable habits. No self control. An infinite, spiritual being trapped in a finite body. Limitations that can't be broken. A desire to fly. Self placed limitations. Limitations that don't exist, but never the less, can't be broken. Only honest with myself and God. Everyone else is thrown a line that they don't bite. People see right through me, and I refuse to accept it. Most people just don't care. They have no reason to. But I wish they would. They would if they had a reason to. But no reason is supplied. This will be misunderstood by all but myself. Close your eyes and slowly back away. Please keep in mind that what you have just read was not written by a troubled, depressed teen who was involved in all types of evil. It was written by a normal, healthy, handsome, Christian, young man. But it shows an inward self that most of us are afraid to let the world see. Justin did not write it to be seen by others; he knew that it might be misunderstood by anyone who saw it. I include it here to make the point that all of us have questions and doubts to deal with. The problem comes not from having questions, but from being unwilling to search for the answers, or from searching for the answers in the wrong places. What better place to look for knowledge about yourself than in the book that was written by your Creator! In the Word of God we can find the answers to many of our questions, and the faith to accept the things we will never understand.